Keoladeo National Park is famous for its (water)birds. 375 species can be found here, among them the rare Siberian crane. 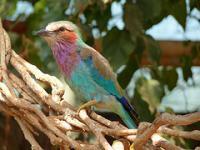 The park is an important wintering place for birds from colder countries in the North, like Siberia and China. During colonial times, the area was used as a duck hunting ground. Since 1981 it is a national park. Keoladeo Park is situated in the town of Bharatpur, 55 kilometers from Agra. It is best visited during the monsoon, when the park comes alive and the birds start courting and nesting. We took a cycle-rikshaw to cross the park. The driver was meant to be our birdwatchingguide too, but he was more interested in our lives and travels. And to be honest: I was more interested in talking to him than looking out for birds. Sorry. I visited this WHS in January 2012. This sanctuary is a birdwatcher's paradise. I spotted several birds such as rollers, kingfishers, herons, treepies, owls, barbets, babblers, crested serpent eagles, painted stork, etc. I was also lucky to see hyaenas, marsh deer, nilgai, grass snakes, etc. A real nature haven! Keoladeo is amazing. My wife and I had a wonderful time there. The wildlife, particularly birds, was astounding. Our visit was made all the better by a superb wildlife guide called Randhir Singh. Look out for him if you visit the park. A wonderful relaxing place to visit on the Agra / Fattpur Sikri road. Stop off, bring your binoculars, and see the wonderful variety of birdlife in the quiet enviorns of the park. The park is a manageable size, and any but the most avid birder (they prefer that name rather than twitcher) will have seen their fill in a few hours. The wetalnds and the tree lined paths can make this a cooler respite from the heat of travellign around Rajastan. 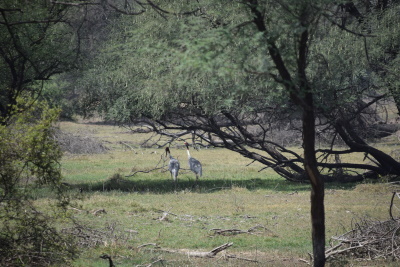 Well the visit to the Keoladeo Bird Sanctuary was the most exciting event that had happened to my life in the recent past. the spottings were numerous and i even saw a live python at an arms lenght.This park has got so many fragile ecosystems which are at peril b'cos of the lack of water in the wetlands. Hope at least this monsoons would be kind to this bird paradise. Hunting or harvesting of Birds: Duck Shooting. The Wetland area was maintained primarily as a duck shooting preserve of the Maharajahs of Baratpur. 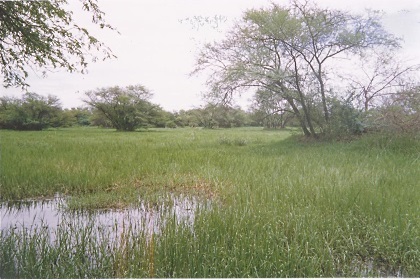 Holocene: The unique habitat is the result of the Ajan Bund built in the 18th Century.